Presidential Approval since Roosevelt. The blue vertical lines indicate midterm and presidential election dates. This graph shows all presidential approval readings by the Gallup organization since Roosevelt. Gallup's long series and consistent question wording provide a useful historical comparison across Presidents. The data are freely available at the Roper Center web site at the University of Connecticut here. The data are graphed here in exactly the same perspective across all presidents. This means that trends will look the same regardless of whether a president served two terms, one term or only part of a term. Visual comparisons of trends will be valid because of this constant perspective. 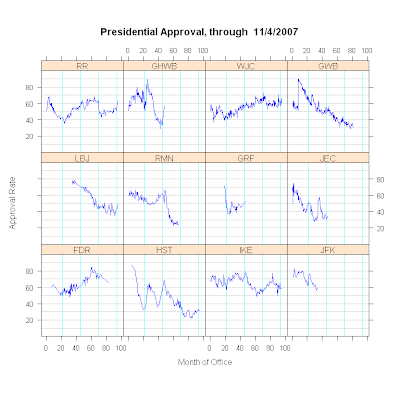 For example, compare the decline prior to the 1992 elections in President George H. W. Bush's approval with those of President George W. Bush. The elder Bush is a clear example of "free fall", the sharpest and largest approval drop since President Nixon's in 1973-74. President George W. Bush's decline more closely resembles the long-term decline of Jimmy Carter's approval than it does the free fall of either the elder President Bush or President Nixon. Because the vertical scales are also equal, it is easy to compare the level of presidential approval across Presidents. A more complete explanation of how the almost universal failure to keep perspective constant distorts presentation of polling results can be found here.